Part way through Tarantino’s eighth picture, Samuel L. Jackson orders his ragtag compadres: “Let’s slow it down. Let’s slow it waaay down.” Is Tarantino imploring today’s adrenaline-fuelled action flicks to apply the brakes? Even the relentless speed of modern life itself? Let’s slow. Things. Down. Let’s stop and smell the (blood-stained) roses. QT’s pictures have always had a wonderfully easy, natural tempo. His characters and plots given more time to breathe. And an unhurried, relaxed pace imbues events with greater gravitas. It begins from the very first shot. The incredibly slow tracking of the opening scene demands that you must slow down. Requires that you immediately adjust to his timing. Forces you to retune to his frequency. Such pacing is a key factor in connecting his films with the classics he famously references, and in making his own work feel timeless, epic, widescreen. Never has he set such a widescreen epic in such confined quarters. As ever, Tarantino recycles the cinematic ingredients that have influenced him. Tempting the quintessential wild west composer Ennio Morricone out of retirement furnishes this dimly lit motion picture with an appropriately dark soundtrack. Music from The Good, The Bad and The Ugly (1966) is reprised, as is his theme for the 1982 groundbreaking body horror The Thing. The central conceit of John Carpenter’s classic remake sees Kurt Russell trapped in a remote ice station, trying to figure out which of his cohorts is the imposter. Sounding familiar? Tarantino is clearly having fun, again pilfering his cinematic toy box. So too, it would seem, is Russell. Magnificently moustachioed, this most alpha of males tries to bombastically boss the band of reluctant renegades, only to trip up on the emotional vulnerability he’s overcompensating for. Now Tarantino is on his eighth he can even include his own films in his melting pot of references. The close up on Jackson’s suspicious eyes recalls Leone’s spaghetti western masterpieces and The Bride in Kill Bill (2003-2004). Reuniting Tim Roth and Michael Madsen among a band of crooked miscreants in a claustrophobic setting will inevitably bring Reservoir Dogs (1992) to mind. You can tell Madsen is a badass just by the way he sits, while Roth is a glorious double caricature of Britishness. As the lone female of the gang, Jennifer Jason Leigh is wonderfully hopeless and depraved, latterly as blood-drenched as an homage to Carrie (1976). Despite this the violence feels toned down compared to some earlier works, a deliberately macabre, yet cartoonish brand of gore. But the picture belongs to Jackson; his commandeering presence is its heart and soul, even if his honesty is never quite assured. As so often with Tarantino, the film’s core strength is its narrative structure. The playing with the timeline. You hang on every word, gradually accumulating the clues, trying to get the measure of the mystery, piece by piece. So by the time the final act delivers its revelations it is uncommonly satisfying. 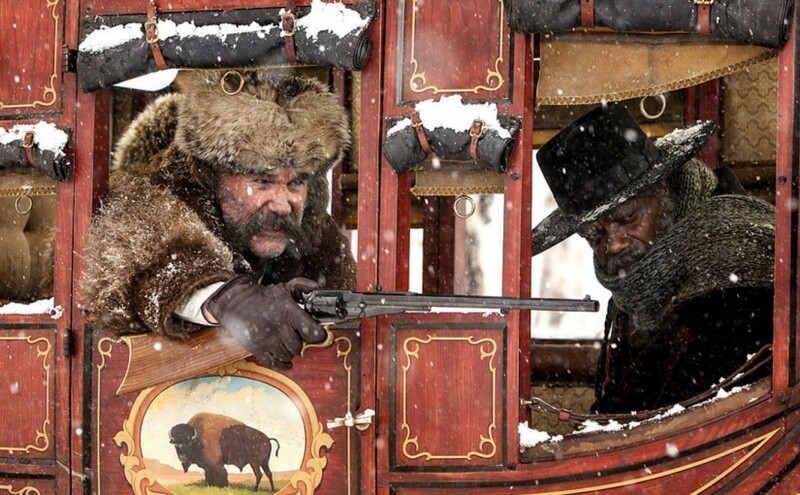 He first strayed into the old west with 2012’s Django Unchained. The Hateful Eight sees Tarantino bed down into a genre that suits him down to the spurs, blending classic elements, including his own, remixing all through a dusty western filter. It’s hard to think of any other contemporary director who would be so at home in such wild and fertile territory. All we have to do is slow it way down and glory in it.